the vital, immaterial, life principle, generally conceived as existing within humans and sometimes within all living things, inanimate objects, and the universe as a whole. [Gr.,=change of soul], a belief common to many cultures, in which the soul passes from one body to another, either human, animal, or inanimate. See J. Head and S. L. Cranston, ed., Reincarnation: An East-West Anthology (1961) and Reincarnation in World Thought (1967). Rebirth of the spirit, or soul, in successive bodies. Originally a Christian tenet, the notion of reincarnation was rejected at the Second Council of Constantinople in 553 CE. Reincarnation is very much a part of Hindu and Buddhist beliefs, and, according to Benjamin Walker (Man, Myth and Magic article, 1970), "is being increasingly adopted as an article of faith by a large number of people in other religious denominations." Rosemary Ellen Guiley suggests that approximately twothirds of today's population "accepts some form of reincarnation or rebirth as a fundamental belief." Belief in reincarnation has existed for thousands of years. The Orphics of ancient Greece believed, through Pythagorean doctrine, that souls returned through a number of incarnations. Through leading a good life, a soul ascended in purity. This cycle continued until total purity was attained, at which time divinity was achieved. This is similar to the Wiccan belief in reincarnation. Witches hold that the spirit goes through a number of incarnations, learning and experiencing in each until all things have been assimilated. At that time, the spirit becomes at one with the gods. The progression has been likened to passing through the grades in a school, where certain curricula have to be absorbed in order to graduate. Since the psycho-physical experience of a male is dissimilar to that of a female, lives as both sexes must be experienced by the spirit in order to gain full knowledge. Witchcraft does not subscribe to the concept of karma, as found in many other religions. Wiccans believe in the "Threefold Law"—the law of threefold return. Do good, and good will be returned, either three times or at thrice the intensity. Do evil, and that, too, will return threefold. But these returns will be within the current lifetime. There is no "putting off" one's rewards or punishments; they come about in this life. In the Hindu and Buddhist doctrines, the point of reincarnation is to return in subsequent incarnations to expiate one's transgressions. In Witchcraft, incarnations are not determined by previous lives, as they are in Hindu and Buddhist doctrine. Each life is a separate experience with its own agenda. 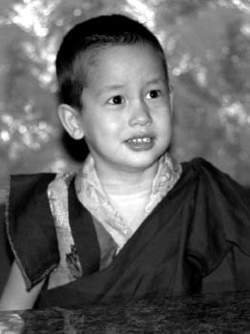 Four-year-old Trulku-la, recognized by Tibetan Buddhists as the reincarnation of a high lama, is shown in January 1996. AP/WideWorld Photos. The belief has certainly existed for thousands of years. The Orphics of ancient Greece held the doctrine from the Pythagoreans that a soul returned in a number of incarnations, each time gaining in purity by living a good life. This would continue until there was total purity, at which time divinity would be achieved. This is similar to the belief held in Wicca, where reincarnation is one of the primary tenets. Wiccans hold that the spirit goes through a number of incarnations, learning and experiencing in each until all things have been absorbed. At that time, the spirit becomes at one with the gods. The progression has been likened to passing through the grades in a school, where certain curricula have to be observed in order to graduate. Because the psycho-physical experience of a male is dissimilar to that of a female, then lives as both sexes must be experienced by the spirit in order to gain the full knowledge. In the Hindu and Buddhist doctrines, the point of reincarnation is to return, in other lifetimes, in order to expiate one’s transgressions. But in many doctrines, each individual life is not dependent upon the previous incarnation; each life is a separate experience with its own agenda. In Spiritualism there is no fixed doctrine on the question of reincarnation. It is left to the individual’s beliefs and feelings. Spiritualists seem evenly split on whether or not they believe in it. However, when Allan Kardec instituted Spiritism, he did make a belief in reincarnation one of the tenets of that particular branch of Spiritualism. Unfortunately, the film doesn't explore her troubled, traumatic past, but goes on a re-incarnation tangent. Spain's Euro 2012 triumph in Poland and Ukraine was achieved with Cesc Fabregas playing an auxiliary role as the attacker furthest up the field but he remains much more of a natural midfielder despite his re-incarnation as a "false nine" at international level. Volkswagen''s modern incarnation of a true motoring icon pre-dated their Teutonic rivals' ' re-incarnation of Alec Issigonis'' classic by a couple of years. Sikhs, like some other faiths, believe in re-incarnation. The supremacists are seen as a re-incarnation of the Safawids who ruled much of the GME between the 16th and 18th centuries AD (see rim6IranSafawidsHistoryJun28-04). Re-incarnation of Hakimullah and his offensive salvos against the US together with his spokesman's statement that TTP was behind the Times Square failed attempt sounded strange but indicated a shift in TTP's strategy. Like the AMS and most Sunni Arabs in Iraq and elsewhere, many Shi'ite Arab tribesmen suspect Iran's current Wilayat ul-Faqih (WuF) version of a Shi'ite theocracy as being a re-incarnation of the Turkoman-led Safawid empire. MONKS at Buljang Temple in Korea are convinced a stray dog is a re-incarnation of a former priest. Whoever or whatever he was, an apparent re-incarnation appeared in New Delhi, India, in 2001 ( the Monkey Man. VOODOO, re-incarnation and the telepathic connection between identical twins -Bill Paterson finds himself investigating all these phenomena in the drama series Sea of Souls. That's me sorted out for re-incarnation, I tell her. Hendrie was against the decision to dismiss Hoddle after his remarks on re-incarnation in a newspaper article.